This is what comes in the box. You get 2 boxes with that link below. 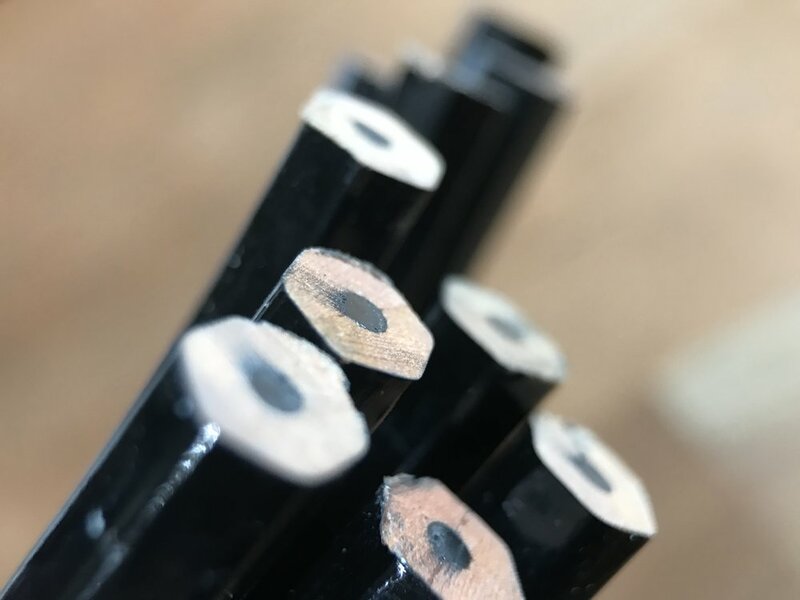 One of the best things about reviewing Indian pencils is that there are so many good ones, but in reality, they are all really similar to each other, so coming up with a new angle is a little tough. 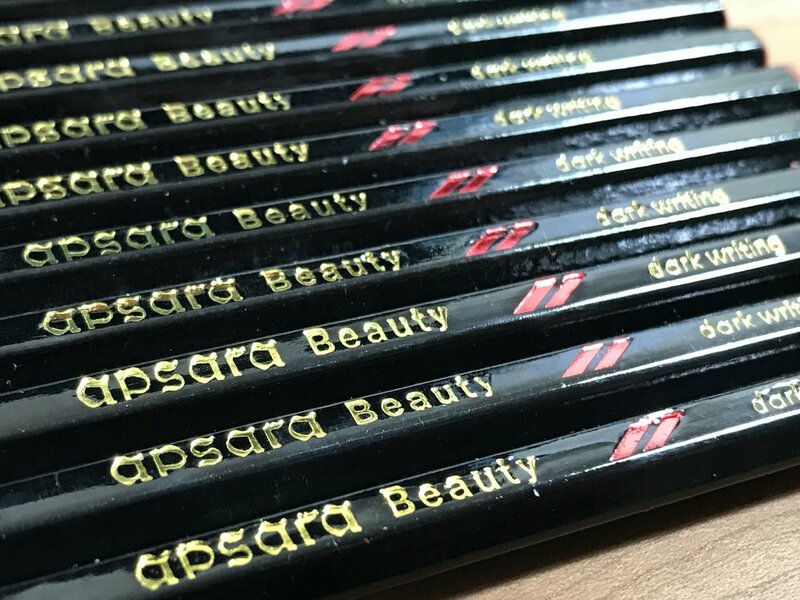 The Apsara Beauty is one such pencil. I like a lot of things about it, however, nothing about it really stands above any of the other Indian pencils I've reviewed this month. They advertise this pencil as dark pencils for beautiful writing on the box. 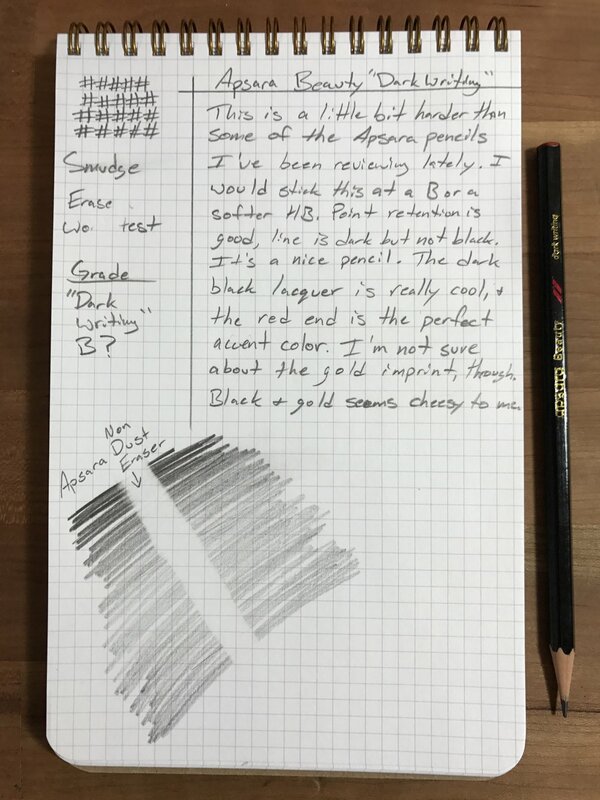 On the pencil, though, it says "dark writing". This one sits at a little harder than some of the other Apsara / Nataraj products, but it's still fairly dark. I guess what makes this pencil a "beauty" is that it's all black with red and gold accents. The lacquer is supposed to be sleek and shiny, but my pencils were a bit old (packaged in Nov 2014) and some of the luster has faded a bit. They're still shiny black, but it just seems like there is a film on them. I think it's just micro-abrasions in the glossy lacquer. It's probably what my jet black iPhone is going to look like in a few years. The imprint is gold. It's well applied without much overrun, but I really don't like the black & gold combo. Something about it gives me a "fancy in the 80's" vibe. That goes for most things black & gold. I just don't like that color combo. Luckily, there isn't much wording on the pencil itself, so it's not egregious. Also, this is nothing like the gold of the Blackwing 530, which I did like, because that gold is a little more muted. I do like the red imprint. It's just the logo, 2 stripes. Very simple, very cool. Really, it looks just like the Dodge logo. They'd have a case if they were in similar industries. That same red is on the end dip. It's very subtle, just dipped on the very end to seal off the pencil. 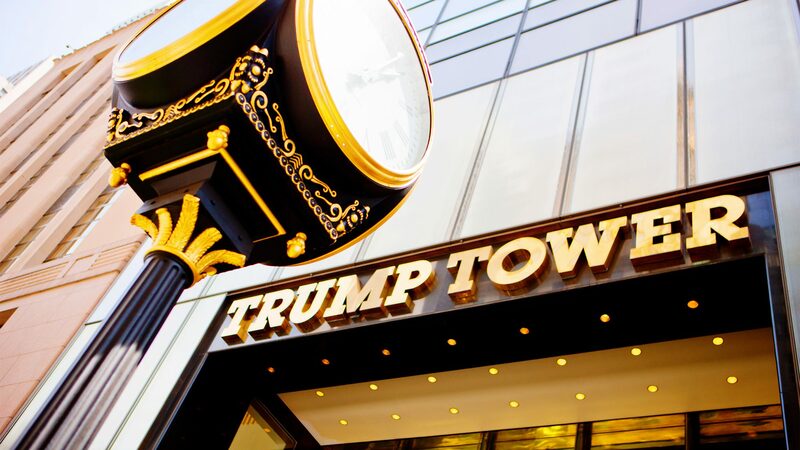 The color of red is not subtle, and if we're sticking with cars and 80's metaphors here, it reminds me of the car that Christie Brinkley drives in National Lampoon's Vacation. This is a light pencil, with no eraser or ferrule to weigh it down. It feels solid and well glued. No chipping of the lacquer or splitting of the wood. It smells like the standard treated wood that Hindustan uses in most of their pencils. It's hex, it sharpens easily, and I have no problem with it in the picky Pollux or any other sharpener. Cores were all mainly centered with a couple minor exceptions. They don't list a grade on the pencil, the box, or their website. However, if they do ever list the "extra dark" they list it as 2B, and they normally list their HB as HB, so this one being "dark writing" leads me to believe it's a B. That feels right in my testing, though it could be a darker HB. The point durability is pretty good, I sharpened it to a longer point and had no issues with breakage. It also held a fairly decent point after my writing sample; see the before and after pictures in the gallery below. There is a tiny bit of scratchiness, but I expect it in a core this hard and dark. I didn't have to sharpen it once during my nightly journal session on the toothy Vanguard paper. It erases well with the included Apsara Non- Dust eraser. This one is a tiny bit of a departure from the other Indian pencils I've been reviewing. The usual vibrant color combos are replaced with a simple black with red accents. The core is just a bit harder than most of the "extra dark" Hindustan pencils out there, so if you find a lot of these to be too soft for your liking, the Beauty may not be a bad option for you. Some of the reasons I am attracted to Indian pencils are the vibrant colors and dark, smooth cores, so for me the Beauty is decent, but doesn't quite hit all the buttons. Available on Amazon, $5.13 for two 10 packs with eraser and sharpener.